After you play an action, shuffle three 0-cost copies of that action into your deck. 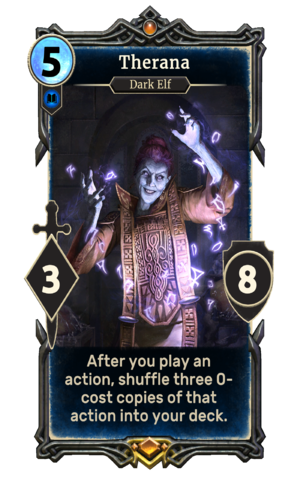 Therana is a unique legendary Intelligence creature card. It is part of the Houses of Morrowind expansion. "Are you listening to me? You'd better be." "Now, where was I? Oh yes, murder." The card's ability applies the A Gift effect, which persists into the Discard Pile. Therana also appeared in Morrowind and later in ESO.